1. Place the sugar, spice and 4 tbsp water in a large pan. Heat gently, stirring to dissolve the sugar, then add the berries and cook for a couple of minutes until they begin to soften and release their juices. Remove from the heat and leave to cool. 2. Strain the berries to separate the fruit from the juice. 3. Line a 1.5-litre pudding basin with clingfilm. Cut 8 of the bread slices in half lengthways, angling the knife slightly so each piece has a wide end and a narrower end. Dip the slices of bread in the juice then use to line the basin, overlapping the pieces so there are no gaps. 4. Place a third of the berries into the bottom of the basin then spoon the mascarpone into the centre and cover with the remaining fruit. Fold over any overhanging edges of bread. Cut the last piece of bread into a round and place on top, then drizzle with a little of the reserved juice (save any remainder for serving with the pudding). 5. Cover the pudding with clingfilm and sit a small plate on top. Stand some cans on the plate and chill overnight. Remove the clingfilm, turn out the pudding and slice. Serve with a drizzle of reserved juice. 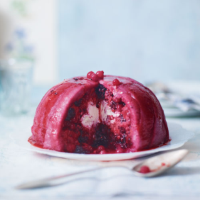 Summer pudding can be made all year round by using frozen berries. This recipe was first published in June 2013.